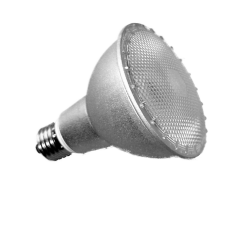 This is a 15w (75w) low energy CFL PAR30 Edison Screw reflector light bulb / lamp giving a daylight white light made by Kosnic which really does the job. It is bright, reliable and with a long life of 8000 hours (4 x that of a non energy saving model). Theese 15W PAR30 light bulb consists of a low energy mini spiral light bulb which is enclosed in a silvered glass bulb, this gives the appearance of a conventional PAR30 lamp but using less than one quarter of the power consumption. NB: These PAR30 CFL low energy saving light bulbs are not suitable for dimming switches and are for use indoors. This CFL lamp is recommended for use with fittings allowing free air flow. When used with enclosed fittings or fittings with restricted air flow, the life of the lamp may be significantly reduced. Please note as with all energy saving spotlights these lamps require a fitting that has some ventilation so the lamp does not overheat.